Stripers grow big and fight hard. They are fun to catch but it takes skill to hook them consistently. On lakes throughout the nation, fishermen and especially striper guides have developed specific techniques for catching more fish, and winter is a good time to use the following methods. Jim Farmer (castawaybaits.com) developed a planer board that met his needs and now sells them to other anglers. He wanted a board that did not interfere with the fight when a fish was hooked, was reversible so it could be changed to either side of the boat, and was highly visible. “Planer boards allow you to get bait out from the boat in a controlled method,” Farmer says. Anglers can put up to 10 boards trailing baits out to cover an area over 100 feet. This allows you to search a lot of water, and both live bait or artificials will work. Many anglers use a combination of baits, at least until the fish tell them what works best. Farmer says he sets the bait to follow the board from 3 feet behind it to a distance from the board that is almost as long as the water is deep. If the line is longer than the depth of the water, you are more likely to get hung up while trolling. Artificials that work best are lures that do not pull a lot on the board, because the tension might trip the board. Bucktails and shallow-running jerkbaits work well. If you need to get your bait down deep, other methods work better. When you get a bite, the board trips and slides easily on the line, much like a slip bobber. A stopper placed a couple feet above the hook stops the board from interfering with the hook and fish. When trolling shorelines of rivers and lakes, put a couple of boards on the bank side of the boat. One should be running a bait in just a couple of feet of water, another a little further out. When you get to the end of a section of bank holding fish, you can turn the boat, reverse the boards and go back down the productive area. Planer boards also allow you to troll very slowly, an important benefit with live bait. Moving at one mile per hour will keep the boards at their maximum spread and not kill the bait, which often happens with faster trolling methods. Captain Dave Willard (crockettrocketstriperfishing.com) has guided for stripers for many years. He says big stripers love the cold and often get right on the bank in a couple feet of water this time of year. He uses planer boards or he flatlines live bait to reach those fish without spooking them. In the winter, Willard constantly watches his electronics. If he is finding all the fish deep, he fishes for them deep. But if fish, especially big ones, are not showing up deep, then he goes to points and banks and trolls. With his boat in 8 to 10 feet of water, he flatlines a lively baitfish and maneuvers the boat around points and along banks so the bait trails in the shallows. A planer board will let you keep your boat farther from the bank, which can be especially important on a gently sloping bank, but may spook very shallow fish. When he is fishing in 8 to 10 feet of water, he also likes to flatline a live bait behind the boat, especially when fish are showing up under the boat. Nose hooking the bait and trolling it slowly with your trolling motor lets the bait move around and does not kill it. The old saying “big baits for big fish” usually applies to striper fishing, but there are exceptions. Willard typically does have a big baitfish native to the waters he is fishing behind the boat. Big bait like blueback herring, gizzard shad, skipjack herring and others all work. But he will also try a small bait like a live threadfin shad to see if the big fish want a small bite to eat. He tries to “match the hatch” and offer the fish bait that is the size of the food they are eating. Shallow trolling also works when the stripers are suspended over deep water. This time of year it is not unusual to see the fish suspended down a few feet from the surface even when the bottom is 100 feet deep. Freelining a live bait with no weight or a very small sinker to get it down a few feet deeper works on these fish. Captain Willard says you may have to cover a lot of water to find feeding fish, but when you do you can catch several. When you catch one, go back over the same area until you don’t get any bites. When stripers are deep it can be hard to get a bait down to them and present it in a way that gets them to hit. 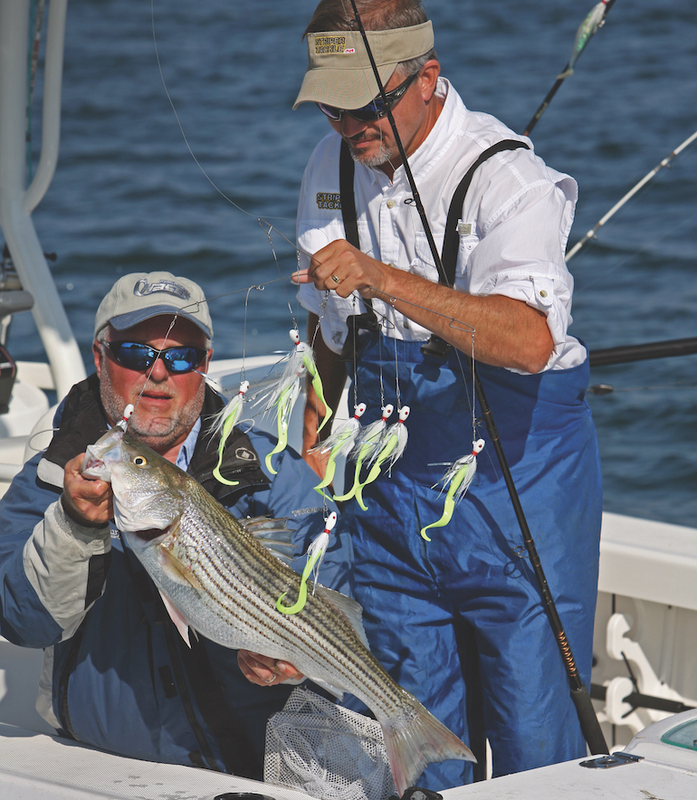 You can sit on top of them and jig a spoon or drop a live bait to them, but you may spook them, and you don’t cover much water doing this — a decided drawback given that you are trying to find stripers, which are nomadic fish. Captain Mack Farr (captmacks.com) likes deep trolling for them. Two methods let you get your bait down to the level the stripers are holding and allow you to cover a lot of water: using lead-core line or downriggers. Lead-core line on your reel requires less equipment and is simpler, but downriggers also work. Spool up a heavy saltwater reel with lead-core line. It comes in 15-, 18-, 27-, 36- and 45-pound test. For striper fishing in lakes and rivers, 27-pound is a good choice. The line is nylon coated for strength, and the lead core makes it go down deep. Lead-core line is color coded, with a change of color every 30 feet, so you can know exactly how much line you have out. Captain Farr ties a 30-foot, 15-pound-test fluorocarbon leader to the lead core. A lighter leader will break if you get hung, keeping you from losing the more expensive lead core, and is less likely to spook the fish. You must use your electronics to find the depth the bait and stripers are holding. You need to troll your bait just over the fish, since stripers will come up a little to take a bait but seldom go down to it. A depth of 30 feet is fairly common this time of year, and balls of baitfish are critical. You can experiment with different weights of line and baits to find the depth your rig runs. Captain Farr says a good rule of thumb is letting out 300 feet of line (nine colors plus your leader). With this length and weight of lead core, a 1-ounce bucktail tipped with a baitfish will get the bait down about 30 feet when trolled at 2 miles per hour. A big bucktail with a live or dead 5- to 6-inch baitfish is Captain Farr’s choice of baits. You can troll crankbaits, too, and they will dive a little deeper, or a jerkbait-style plug to run a little less deep but with more flash and action. Downriggers are heavy weighs that are lowered on a cable. The weight has a clip to hold your line and releases when a fish hits. You can troll a variety of baits behind the downrigger ball and it will keep them at an exact depth. Electric wenches on downriggers help you get the cable up quickly while fighting a fish, but they are more expensive than hand cranked ones. If you have several downriggers out you take a chance on the striper tangling in the cables while fighting it, even with electric wenches. Bill Carey (striperexpress.com) guides for stripers but uses only artificial baits, and casting them is his preferred method of fishing. His go-to bait is a chartreuse or white 1/2- to 1-ounce Road Runner underspin with a 9-inch white worm trailer. He says this is his big-fish bait. Carey also casts 5.5-inch Zoom Flukes and 4-inch Sassy Shad plastics on 1/2- to 1-ounce jig heads. He runs structure like ditches, creek channels, humps and main lake points. The best ones are shallow areas that drop quickly into deep water. Stripers will push baitfish up on these kinds of places, trap them, and feed on them. Find that kind of structure and then make long casts across it, keeping your boat out in the deep water and casting up to the shallow areas. Reel at different speeds in order to control the depth at which your bait is running. Stripers may want your bait anywhere from just under the surface all the way down to the bottom. Carey says big stripers are much like big bucks — they are loners. Big ones might run in a small group of two or three, but they are not usually in big schools. Nevertheless, when you catch one big one, make repeated casts to the same area. Always watch for birds diving and surface activity. Even in the winter, keep a big pencil popper tied on and cast it to any activity you see. Also try it over the structure, even if you don’t see active fish. 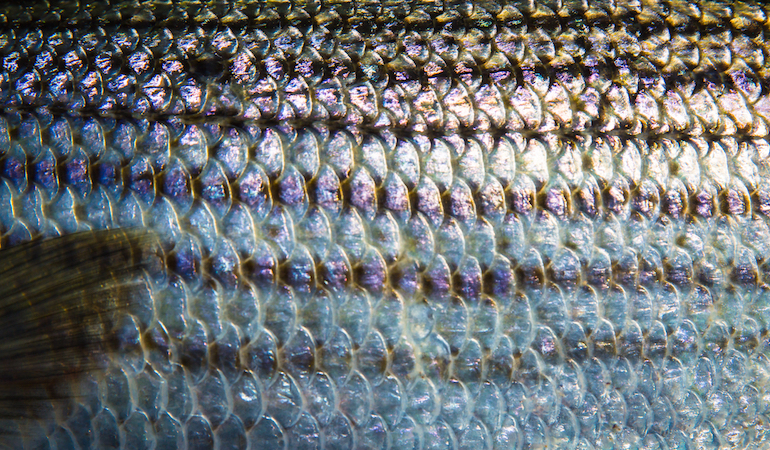 These methods will help you catch stripers this time of year.